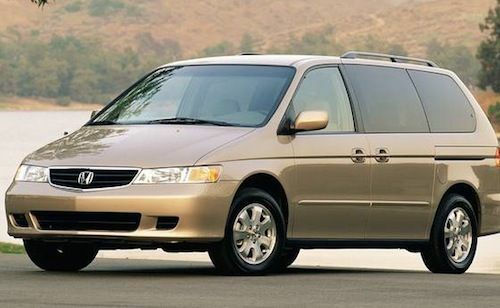 Honda is recalling over 870,000 minivans and SUVs worldwide due to a dangerous roll away risk. The recall affects 277,000 model-year 2003 and 2004 Honda Pilot SUVs and 347,000 Honda Odyssey minivans, as well as 247,000 model year 2003 through 2006 Acura MDX SUVs. Just over 807,000 vehicles were sold in the U.S. and all contain an automatic transmission. Specifically, the recall concerns the failure of a locking mechanism that is designed to secure the key in the ignition. Failure of this device may lead to Honda Odyssey and Pilot owners being able to remove their keys without putting the vehicle in park. Consequently, certain vehicles run the risk of unexpectedly rolling away while in gear. Honda’s recall stems from an October investigation by the National Highway Traffic Safety Administration. The government agency launched the probe after receiving 43 complaints of vehicle roll away, 16 of which resulted in crashes. There were also two injuries reported to the NHTSA. In one case, a driver reported suffering a broken leg after being run over by his 2003 Honda Odyssey. “I had an open fracture on my fibula (lower leg bone) and crush injuries on my shin area,” said the driver to the government agency. Honda will begin notifying customers of the recall in February and dealers will repair the ignition interlock system, free of charge. In the meantime, owners can contact Honda at 1-800-999-1009 or the National Highway Traffic Safety Administration’s Vehicle Safety Hotline at 1-888-327-4236. Since driver notification is nearly two months away, Pilot and Odyssey owners are advised to be cautious in the interim. The best way to safeguard against roll away danger is use the parking break when the vehicle is stopped. The NHTSA also stated that a brake investigation is still ongoing, which may lead to a separate recall. There is no solution for the brake issue, but investigators are examining issues with a computer-controlled brake system. The probe includes nearly 88,000 model-year 2005 Honda Pilots. Roll away recalls are nothing new for the automaker. In fact, Honda recalled over 50,000 model-year 2012 Honda Civic coupes and sedans due to a driveshaft separation issue, which may contribute to loss of drive power and roll away risk. Additionally, in August 2010, Honda recalled about 383,000 Honda Accord, Civic and Element vehicles for an ignition interlock problem. The recall, which included 2003 and 2004 models, was nearly identical to Honda’s latest roll away recall. Aside from roll away problems, Honda recalled 2004 and 2005 Pilot SUVs in October due to a hazardous headlight defect. The recall, which concerned 820,000 Pilot SUVs and Honda Civics, was issued due to headlight control wiring defect. On certain vehicles, the headlight control switch may overheat and melt, causing the low-beam headlight failure. This past year has not been kind to Honda in terms of recalls. Aside from the numerous aforementioned instances, the automaker also recalled 268,000 model-year 2202 through 2006 Honda CR-V crossovers due to a dangerous fire problem. The October recall stemmed from a driver-side power widow problem, which may contribute to the window switch failing or melting. Consequently, the failed switch may overheat and result in a fire. Stay tuned for more details concerning the NHTSA’s probe into brake problems in the Honda Pilot. If the issue is deemed serious enough, it will result in a recall.